Roxy is a pancake machine. She has an uncanny ability to whip up all sorts of pancakes from scratch, using whatever she comes across in our cupboards. These chocolate protein pancakes are her latest creation. They’re an indulgent breakfast (or more likely brunch) with a twist. A lot of the ingredients combine to give you a decent dose of protein. 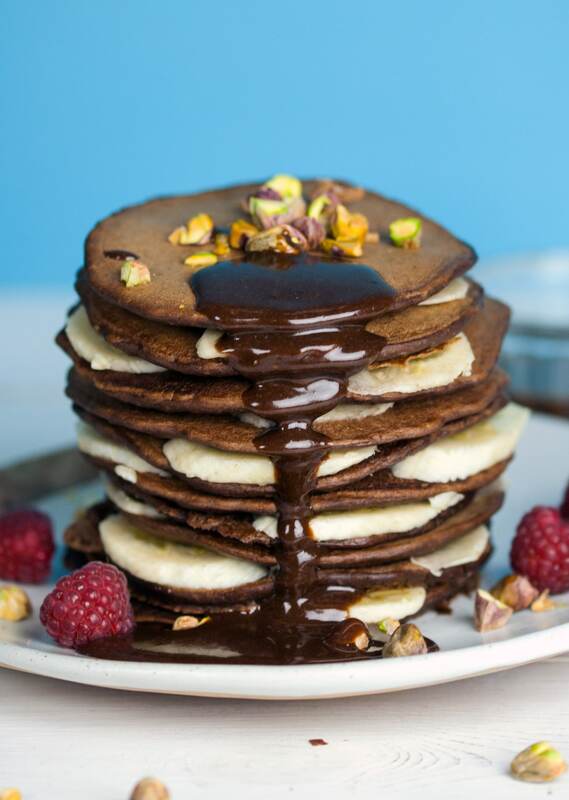 From the chia seeds and hemp seeds to the oats and even the flour, each pancake includes a healthy 4.5g of protein. 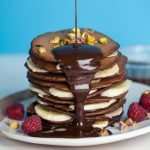 So the next time you’re wondering where you’re going to get your protein from, try this chocolate pancakes on for size! Oh, and in case you didn’t know, we’re releasing a cookbook! So Vegan in 5 is a 5-ingredient vegan cookbook and it’s available to pre-order on Amazon today. Thank you so much to everyone who has already ordered a copy. It means so much. You’ll also need some coconut or vegetable oil for frying. Add all the ingredients for the pancake mixture to a blender. Blend until completely smooth, then pour the mixture into a measuring jug. Add a little oil to a frying pan or a skillet on a medium heat. Once the oil is hot, pour roughly 2 tbsp of the mixture into the pan to create a pancake roughly 10cm in diameter. Use the back of a metal spoon to smooth the edges into a circle if necessary. Fry for 2 minutes on each side. Repeat with the remaining mixture until you’re left with 10 pancakes, adding small amounts of oil when necessary. Meanwhile, prepare the tahini chocolate sauce by adding all the ingredients to a small bowl and stirring until smooth. 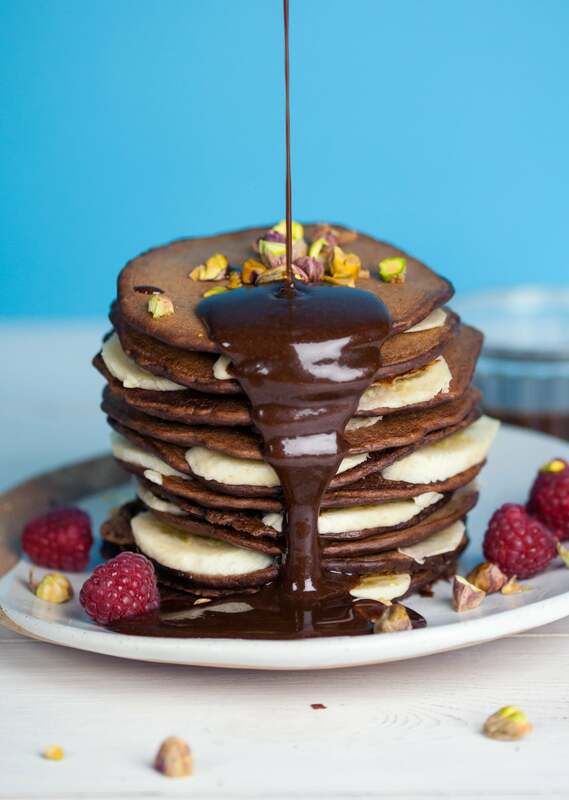 Serve the pancakes with slices of banana, crushed pistachio nuts and the chocolate tahini sauce.